When you google reading comprehension worksheets, you are inundated with passages followed by questions. Familiar sight? !Questioning is often seen as the only way to approach reading comprehension. And inevitably, it is in context to English as a subject, maybe extending to the social sciences - God forbid were we to see it in math class or in the chemistry question paper! Levity apart, this mode of the passage- followed -by -questions is mostly an evaluation of reading comprehension. What about approaches to explicitly teaching reading comprehension? Before we share our experiences, we would like very briefly, to set the context of reading comprehension and approaches to teaching it; then delve into the core topic of this article. The adage ‘Reading maketh a man’ hasn’t gone out of style - The world runs on that constant cascade of information from various sources, from good old fashioned books through to the Kindle. Today’s reader requires to manage these complexities. In the order of language skill acquisition, reading and reading comprehension is sandwiched between oral language and written expression. It is regarded as the bridge between these two essential skills of communication, knowledge acquisition and literacy of course. Reading comprehension is a complex process, being the relationship the reader has with the written word. The reader constructs deep meaning from what is being read. The content of meaning is influenced by the reader’s prior knowledge, experience and setting in which the reading takes place. The situational context or setting: whether the home or classroom, in a quiet space like the library, during a test, affects how text is comprehended while reading. Automaticity in decoding, print orientation and knowledge, fluency, vocabulary skills, attention and memory are pre-requisites to reading comprehension as is fluency., though it is not the same as automacity. Fluency is the reading, connecting and reading in-text material effortlessly and with expression. Vygotsky’s social construct and context of learning deserves mention here. While reading comprehension is an individual activity , it can be enhanced when part of a social activity, as in a classroom, where teachers and students, or parents and children read together and construct meaning through discussion together. Reading strategies and learning are interwoven, that is if a learner has failed to understand the content of the text or tasks, learning will be, if not a challenge, impossible. As the student advances through school, the content becomes more complex, more in-depth and requires far more proficiency in reading and accuracy. The better the reading strategies, the earlier acquired, the higher the chances of effective learning. For struggling readers, comprehension of the text may be impacted due to lack of varied and rich vocabulary, deficits in the phonological processes, deprivation of adequate teaching comprehension strategies, lack of motivation and inattention. Brindavan Education Trust is an exclusive remedial centre for students who have been diagnosed with severe specific learning difficulties, Attention Deficit Hyperactivity Disorder (ADHD), high functioning children on the Autism Spectrum, disorders such as school refusal and other psychological disorders. The junior programme focuses on academic skill development and concept learning according to relevant scope and sequence. The senior programme focuses on teaching select NIOS (National Open Schooling) subjects for secondary and senior secondary grades (10th and 12th classes). Curriculum - based skill development continues since students continue to have difficulties with academics. Since the focus is on taking exams, teaching reading comprehension plays a huge role in the day -to -day teaching at Brindavan. Reading comprehension in context to academia needs to be explicitly taught to be developed in a systemic way. Most text is divided into narrative or expository. Through many years of continual research, teaching trial and error and training Brindavan follows the solid practice of teaching and using strategies to enhance reading comprehension in their students, a few of which are: activating prior knowledge, graphic organisers, concept mapping, webs. The focus of this article is primarily on lesson adaptation, which is the child of differentiated teaching instruction, as a tool to enhance reading comprehension and aid learning. It is the standard required practice of meeting diverse learning needs especially in a classroom with special education needs and is a given at Brindavan. The approach to reading and comprehension is the three step approach – pre- reading, reading and post - reading. Our typical class strength is eight students per classroom. In comparison to sixty neurotypical students, this is a very small number. However, catering to each learner’s diverse complex needs requires teaching individually and in small group setting. In the context to reading and reading comprehension, adaptation is not to be confused with adapted texts – where literary classics, such as Tolstoy’s War and Peace, are officially adapted, published and sold so as to reach a wider audience including children. 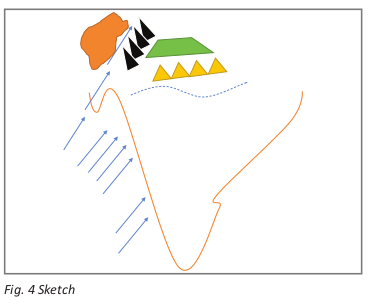 Academic Lesson adaptation is a strategy, method, a tool to modify lessons for better learning. Adaptations can be across three domains – we have further explained it in context to reading and reading comprehension. a. Content – the actual text that student needs to learn. Content can be adapted to keep key concepts and vocabulary intact. This reduces reading load on the student. This is especially useful for students with dyslexia. The text can further be adapted to suit a specific learner’s needs. b. Process - of instruction or reaching, teaching the text to students. This involves the student to engage with the text. 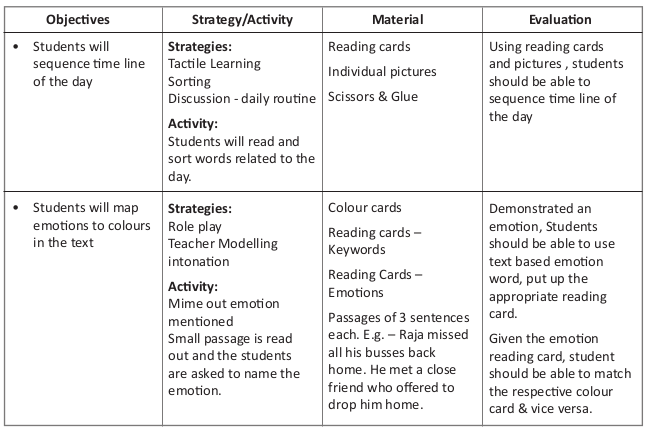 One of the best approaches to reading comprehension is the three stage approach – pre-reading, reading and post-reading. The reader is scaffolded with the aforementioned strategies to master the text to the best of their capability. 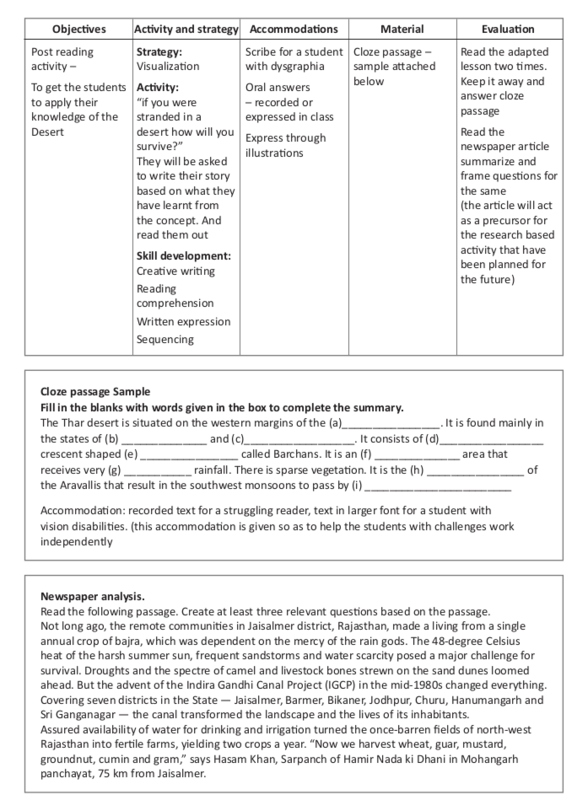 c. Product – evaluation of the text where the student is provided with the opportunity to demonstrate what has been learned. Levels of difficulty, group or individual work, learning style can all be adapted to assess text comprehension. d. Learning Environment – this includes physical and affective aspects of classroom adaptation and management. Creating a safe learning environment boosts motivation which is a huge component of reader engagement. The classroom can be adapted to accommodate a reading corner, seating to accommodate collaborative learning. 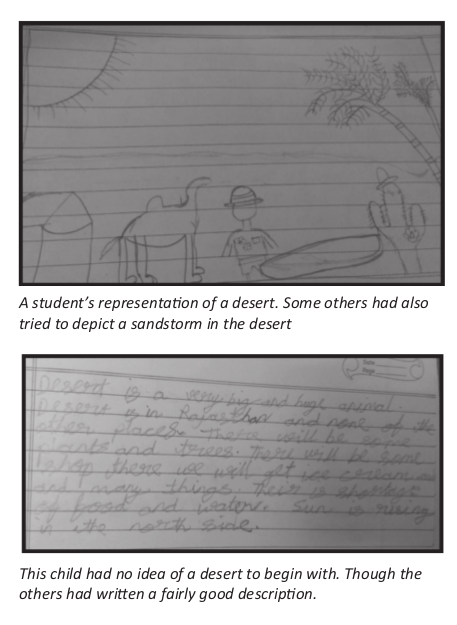 e. Here are two samples of how text is adapted for teaching . We hope to successfully demonstrate the teaching process and strategies to enhance reading comprehension and aid learning. 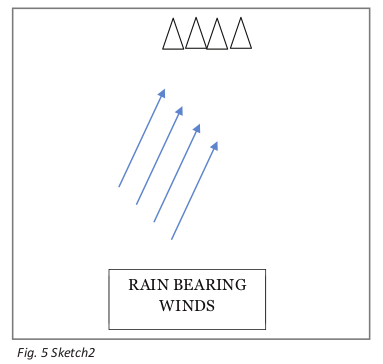 The first one is adapted for the Pre – NIOS level ( roughly grade 9) from the NCERT textbook. The second sample is for the Junior NIOS ( 10th grade) class in English. Thar Desert, also called Great Indian Desert. 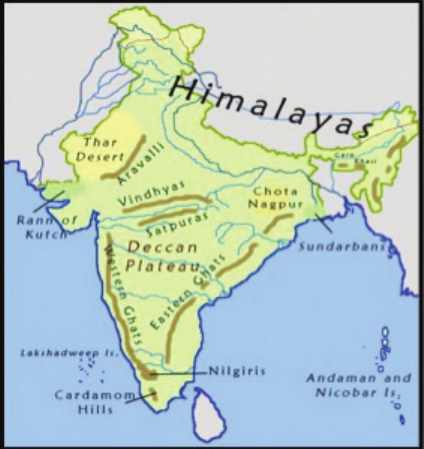 The Indian desert lies towards the western margins of the Aravalli Hills. It covers the state of Rajasthan and parts of Gujarat. 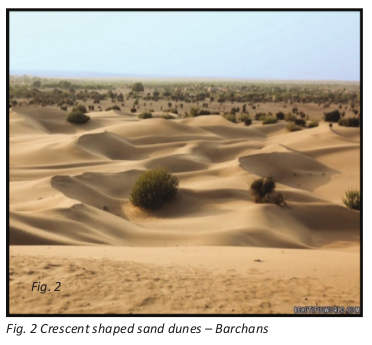 It is an undulating sandy plain covered with sand dunes called Barchans (crescent shaped dunes). This region receives very low rainfall below 150 mm per year. 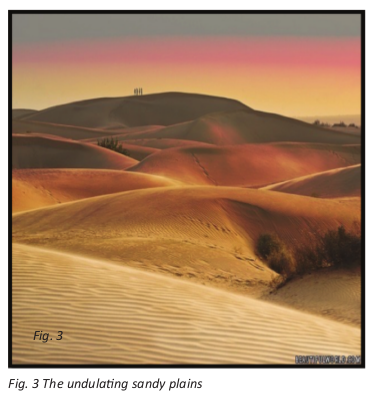 It has arid climate with low vegetation cover. Streams appear during the rainy season. Soon after they disappear into the sand as they do not have enough water to reach the sea. Luni is the only large river in this region. a. When the desert is hot people are fair but when you go to Chennai people are dark. Why? Melanin in their body (the desert) should be more to be dark. With respect to summarizing students found it challenging but when the teacher asked questions as cues the students were able to give appropriate answers. Inspite of these question the students found it a challenge to express their thoughts in their own words. in order to guide the thought process of the students the teacher gave her own version of the summary the students were able to write even after a break. To bring the session to a close the students were asked to come up with 3 relevant questions based on the passage. Samples given below. 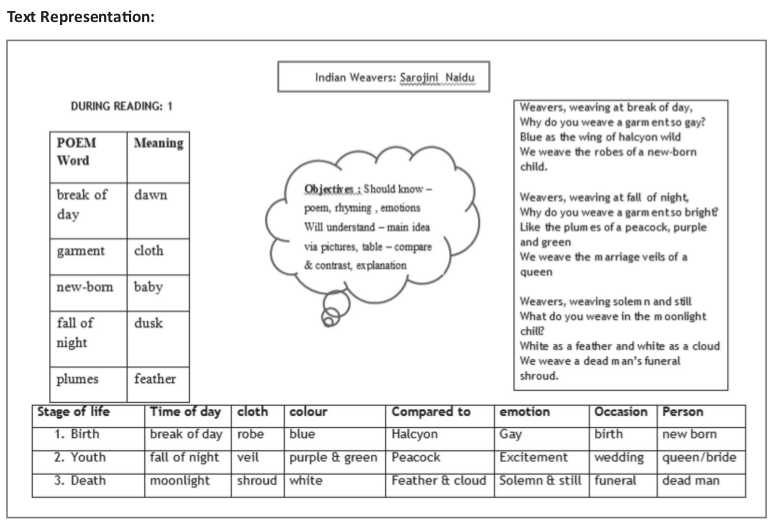 Sample 2: Text adaptation of the English lesson ‘The Indian Weavers’ by Sarojini Naidu. The poem, while short, is rich in imagery and abstract thought. Here’s a brief of the poem to give you context. The weavers are weaving various types of cloth in different hues through an entire day. 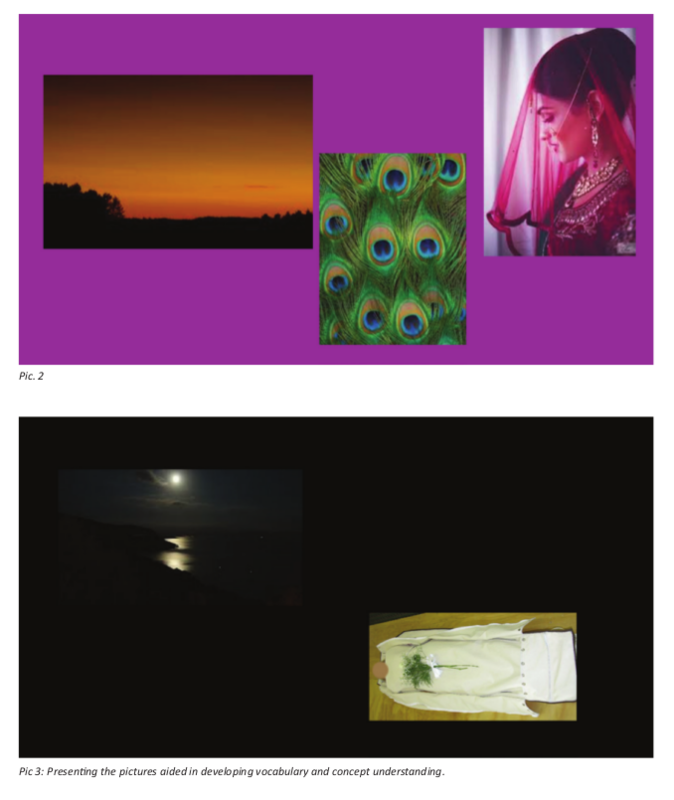 Each colour, time of the day symbolises phases in an individual’s life. At dawn, a bright blue coloured cloth is woven for a new born baby symbolising birth and happiness; day/ dusk a bright coloured purple and green cloth for the marriage veil of a queen signifying life’s celebrations. Finally, night and twilight a white shroud is woven signifying death. Colours symbolise different feelings, moods and ideas, e.g. red colour symbolizes romantic mood or love and danger. 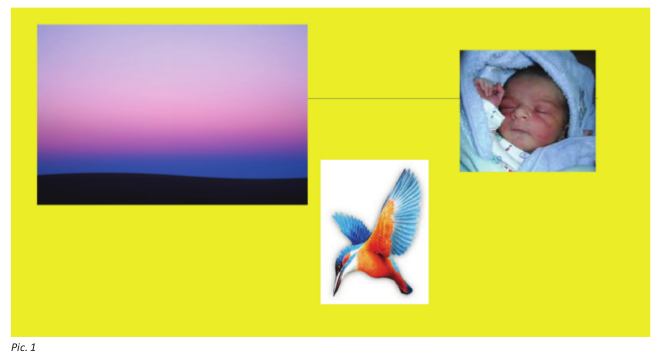 Different times of the day represent different stages of life – morning represents childhood, evening youth and night death, or end of life. 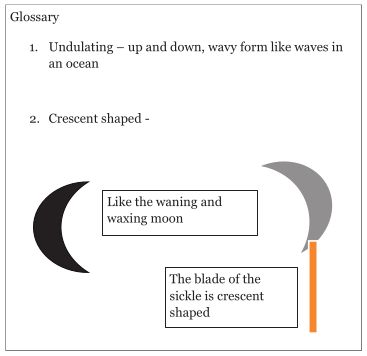 Reason for adaptation of the text – Given the student profile and one teaching trial, it was evident that the class found time concepts, rich word imagery such as metaphors, similes and certain unfamiliar keywords difficult to comprehend. To facilitate their learning, the text needed to be adapted. Here the adaptation was to represent the lesson in a completely different format that would better be understood by the class. Thought the length was short the concepts were complex and abstract. The focus of this section is on the pre-reading stage. The primary strategy is visualisation and word reading drills to build vocabulary and familiarise students with words from the text. The objective was also to demystify the notion of a poem being difficult to understand. 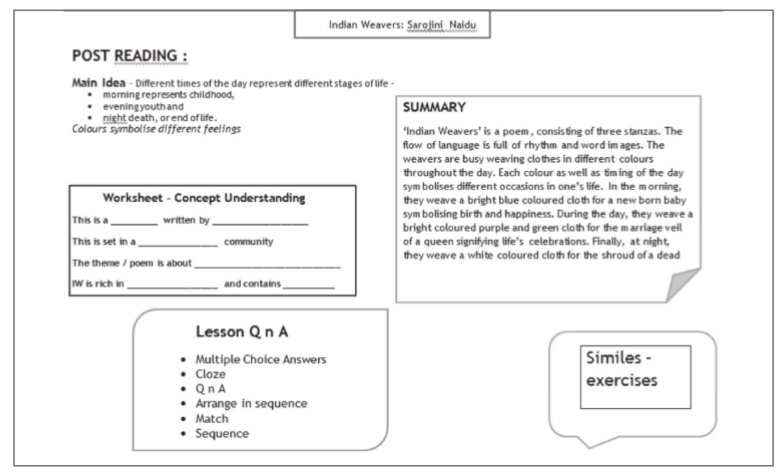 Here is the lesson plan for the pre – reading section. Pic 4: The entire poem was represented as a table as shown in the picture above. This format of representation, chunking and the preceeding pictures helped during reading and explanation of text. However, one student was unable to still comprehend the text given all formats. He didn’t have issues with word attack. However, he found it difficult to copy and translate text into tabular format. He fared better in the following activity that combined listening comprehension as well. 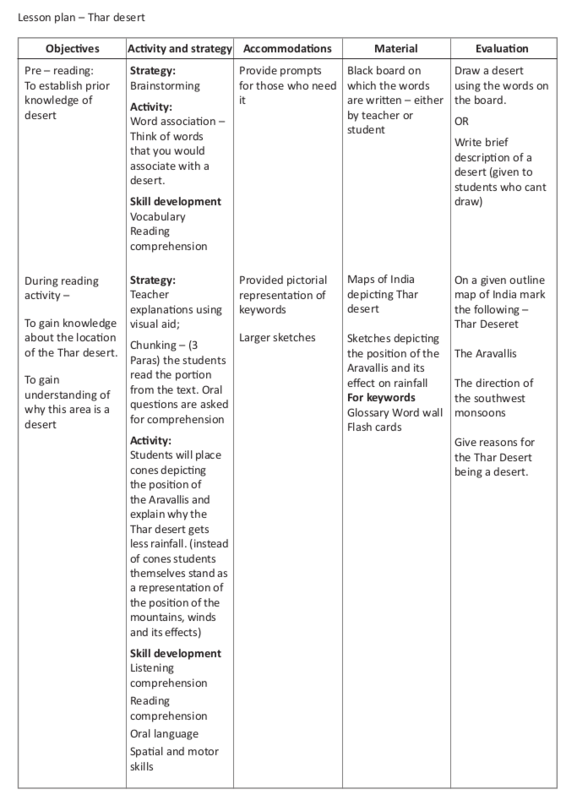 Pic 6: this is an outline of the post -reading tasks that will lead to evaluation. At Brindavan we also explicitly teach students to read and understand questions in question papers. The NIOS pattern of questioning is mostly application- based questions. Hence a crucial part of reading comprehension program is an emphasis on understanding instructions because that determines accurate output. Beck, Isabel L, and Margaret G McKeown. Improving Comprehension With Questioning The Author. New York, N.Y., Scholastic, 2006,. Coiro, Julie. ‘Predicting Reading Comprehension On The Internet.’, Journal Of Literacy Research, vol 43, no. 4, 2011, pp. 352-392. SAGE Publications, doi:10.1177/1086296x11421979. Israel, Susan E, and Gerald G Duffy. Handbook Of Research On Reading Comprehension, Second Edition. New York, Guilford Publications, 2016,. Kieffer, Michael J., and Nonie K. Lesaux. ‘Breaking Down Words To Build Meaning: Morphology, Vocabulary, And Reading Comprehension In The Urban Classroom.’ The Reading Teacher, vol 61, no. 2, 2007, pp. 134-144. Wiley-Blackwell, doi:10.1598/rt.61.2.3. Rose, Terry L. ‘Effects Of Illustrations On Reading Comprehension Of Learning Disabled Students.’ Journal Of Learning Disabilities, vol 19, no. 9, 1986, pp. 542-544. SAGE Publications, doi:10.1177/002221948601900905. ‘Teaching Reading Comprehension’, Bellarmine.Edu, 2017, https://www.bellarmine.edu/docs/default-source/education_docs/Reutzel_Co... Comprehension_TCR_5e_2.aspx. Vellutino, Frank R. et al. ‘Differentiating Between Difficult-To-Remediate And Readily Remediated Poor Readers.’ Journal Of Learning Disabilities, vol 33, no. 3, 2000, pp. 223-238. SAGE Publications, doi:10.1177/002221940003300302.